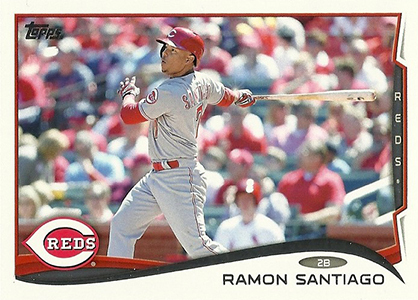 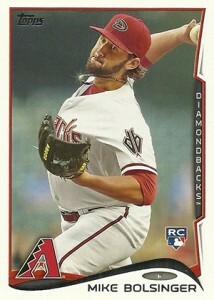 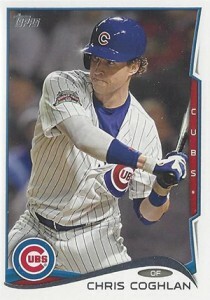 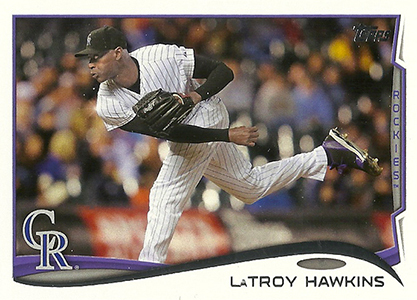 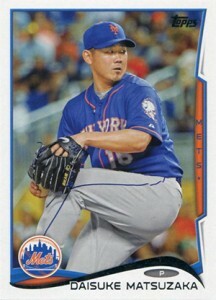 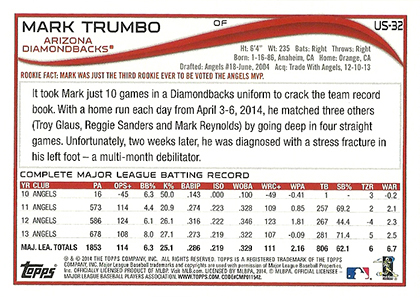 Much like Series 2, 2014 Topps Update Series Baseball variations fall under three categories: Photo Variations, Sabermetric Stats and Sparkles. 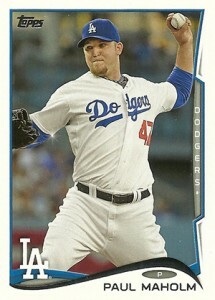 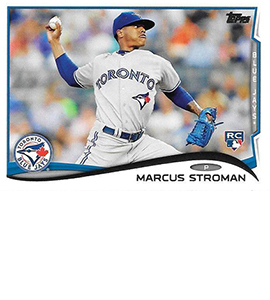 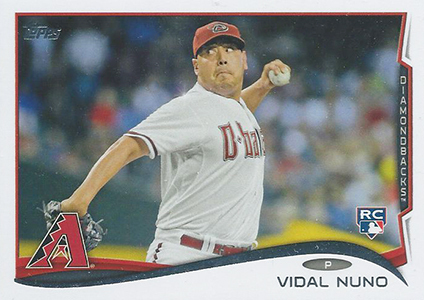 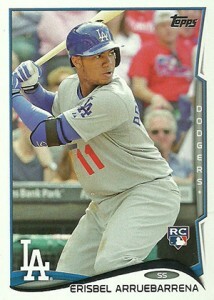 Shop for 2014 Topps Update Series Variations on eBay. Photo Variations are your basic image swaps. 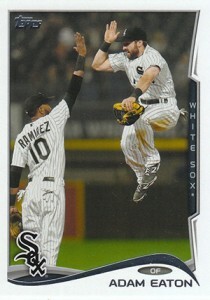 These don't follow a defined theme like some other sets do, although most show the player celebrating in some fashion or sharing a moment with another player. 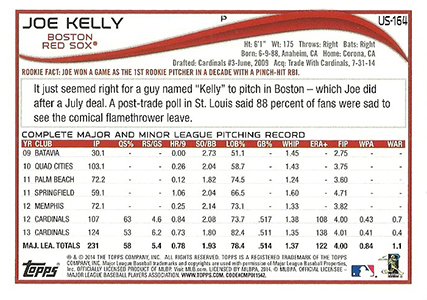 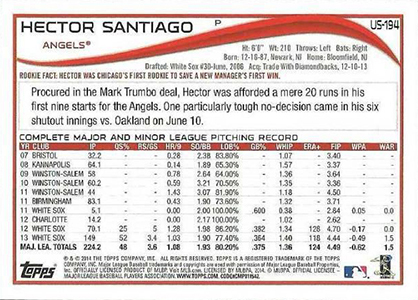 Sabermetric Stat variations require you to look on the back. 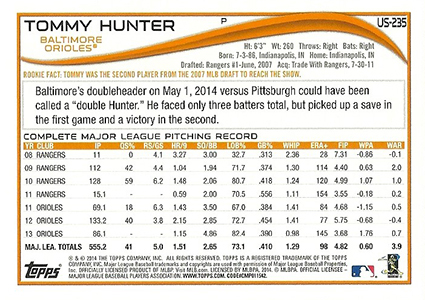 These have a different set of stats than traditional cards. 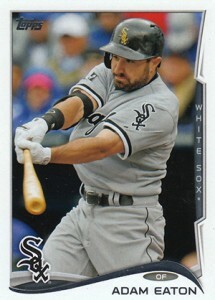 Perhaps the toughest variations to spot are the Sparkles. 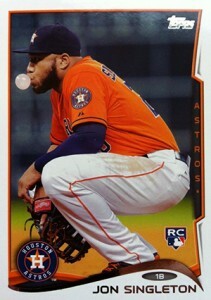 These have a little twinkle added to the card somewhere. 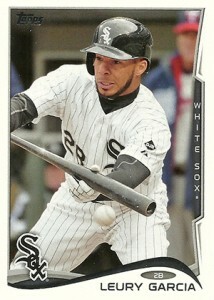 Because this sparkle is small and white, they often blend into the image and aren't very noticeable. 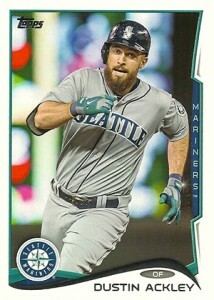 Card backs offer a hint as to whether you have a variation as well. 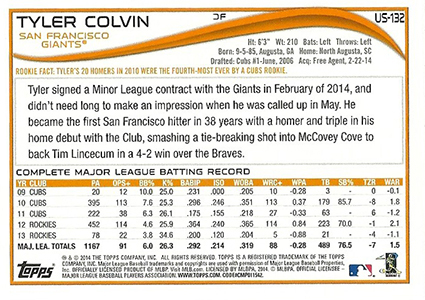 If you look in the fine print at the bottom, you'll find a numeric code. 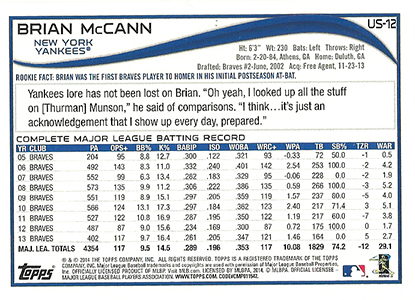 These identify different types of cards. 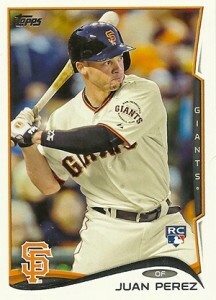 Base Cards end in 480. 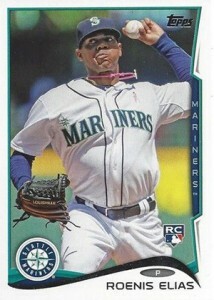 Photo Variations end in 540. Sparkle Variations end in 543. 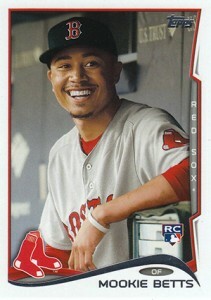 The one exception to the code rule is Mookie Betts' Photo Variation. 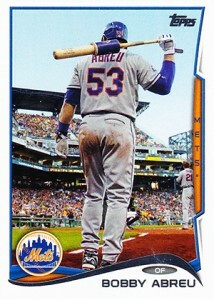 It ends in 480 like his base card. 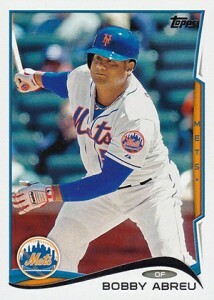 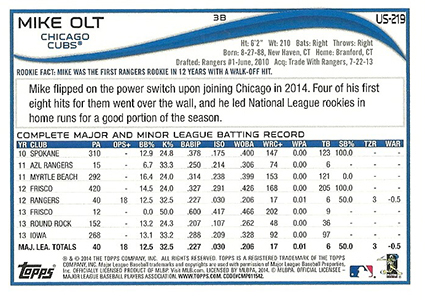 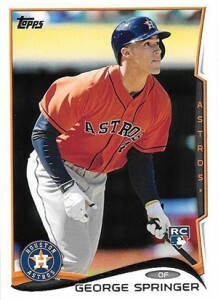 To help make sure you don't miss any 2014 Topps Update Series Baseball variations, we've compiled a detailed guide that not only has a simple cheat sheet checklist but visual comparisons as well. 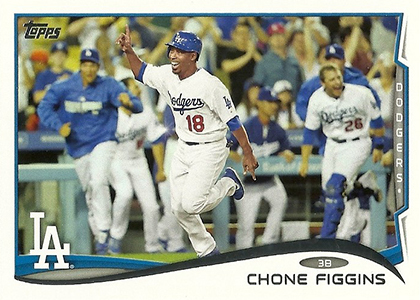 The following is a master checklist of all confirmed 2014 Topps Update Series Baseball variations. 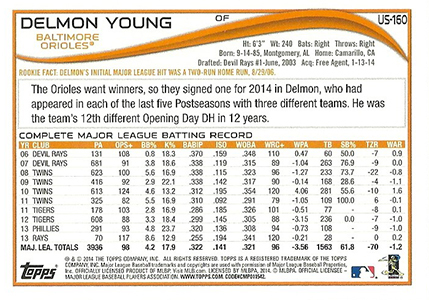 Click on the tabs above for visual guides to specific variation types. 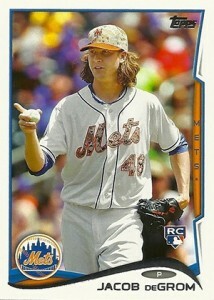 2014 Topps Update Jacob DeGrom Rookie RC SP US-50 Photo Variation MAKE AN OFFER! 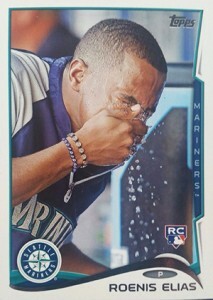 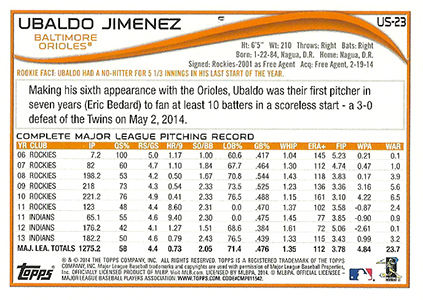 The code on the back of 2014 Topps Update Sparkle Variations ends with 540 (in the fine print). 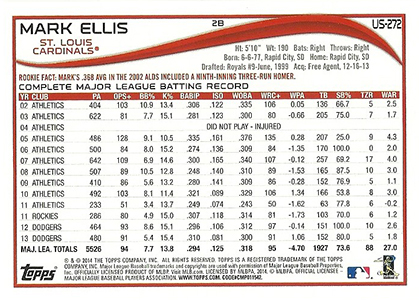 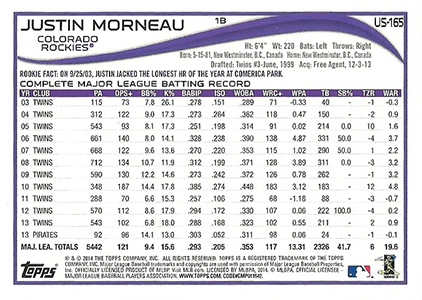 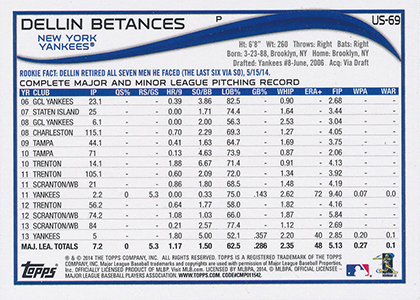 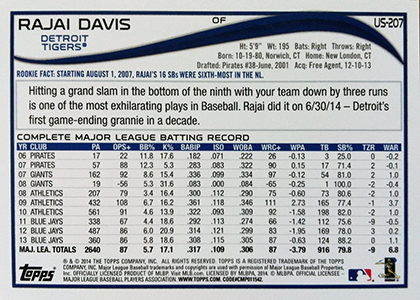 The one exception is Mookie Betts, who ends with 480, like base cards. 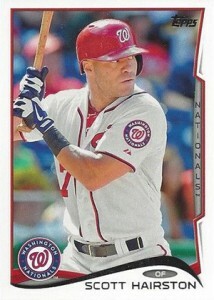 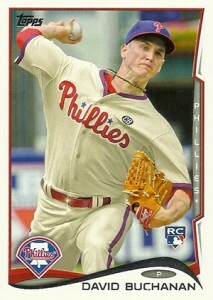 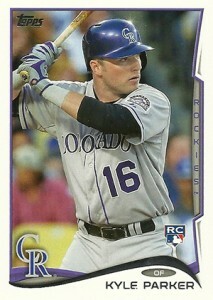 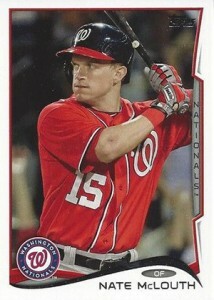 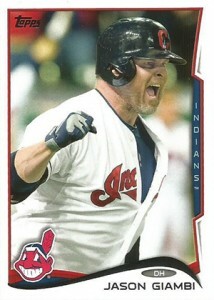 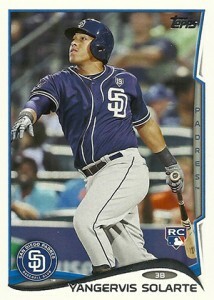 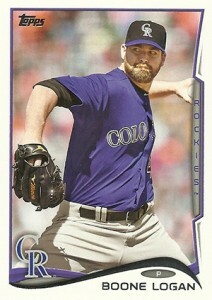 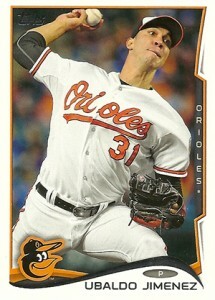 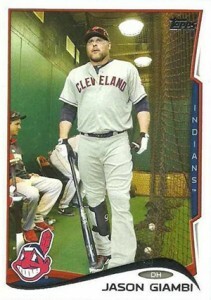 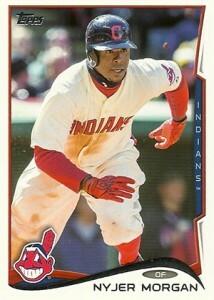 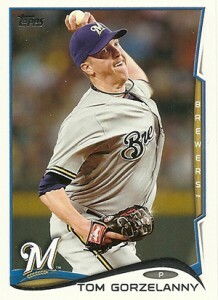 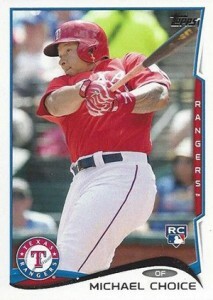 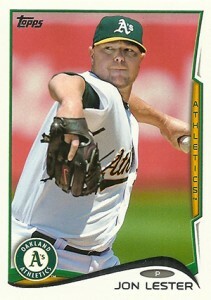 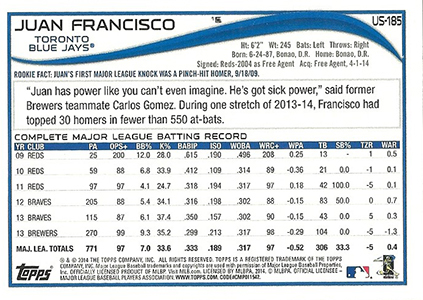 Note: code on back of variation ends in 480, the same as the base card. 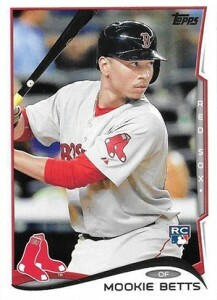 2014 Topps Update Mookie Betts RC Variation Dugout Boston Red Sox Rookie Hot! 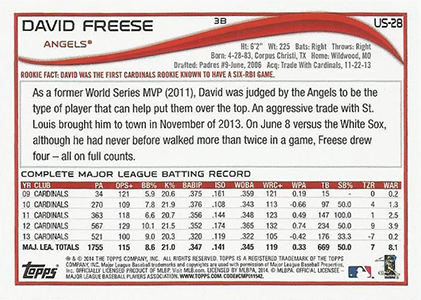 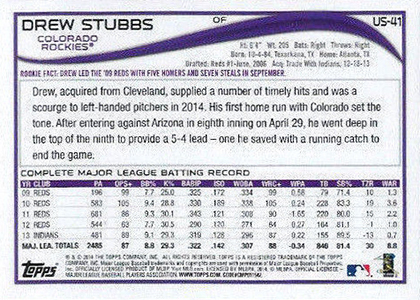 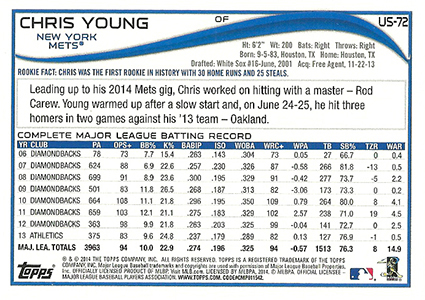 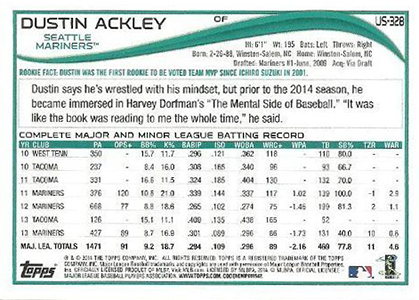 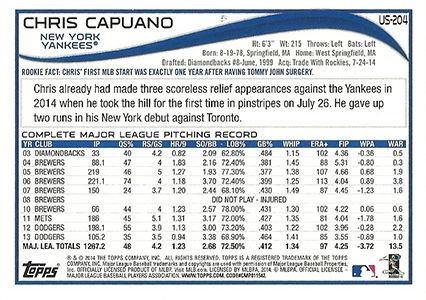 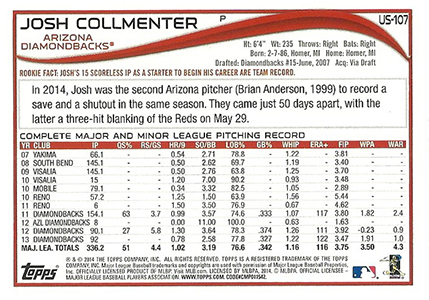 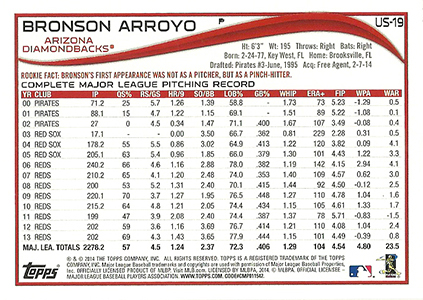 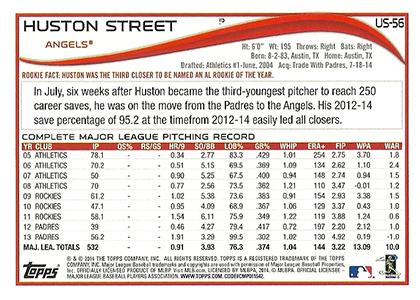 The code on the back of 2014 Topps Update Sabermetric Variations ends with 542 (in the fine print). 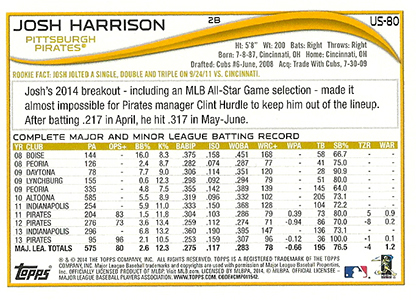 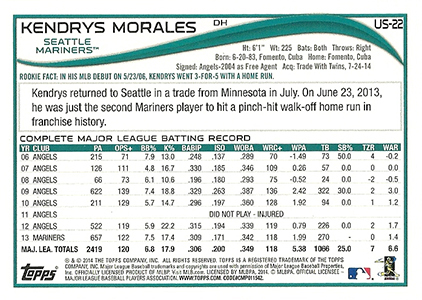 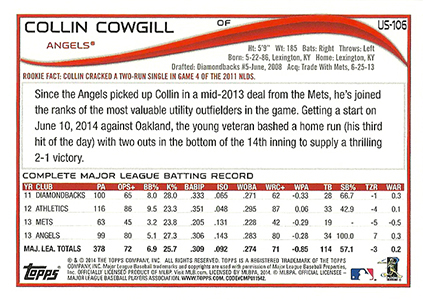 The code on the back of 2014 Topps Update Sparkle Variations ends with 543 (in the fine print). 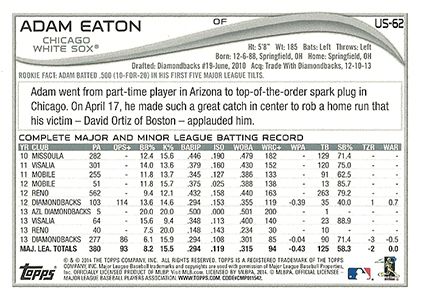 If you're still having troubles seeing where the sparkles are, our Sparkle Spotter highlights exactly where they are. 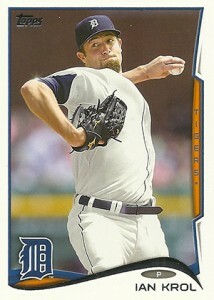 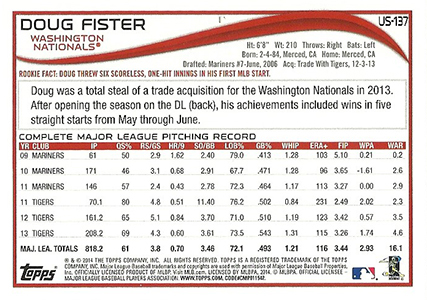 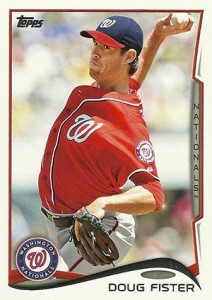 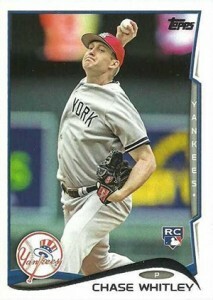 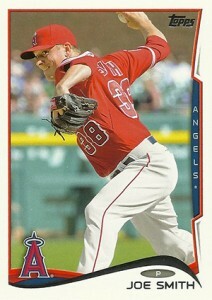 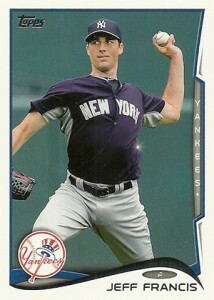 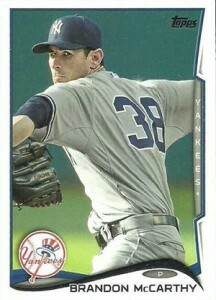 Doug Fister #US-137 has a sabermetric variation. 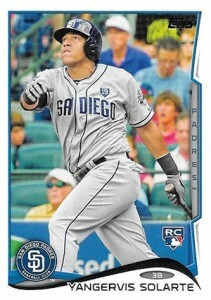 I just pulled it. 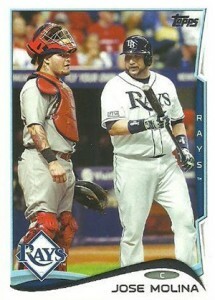 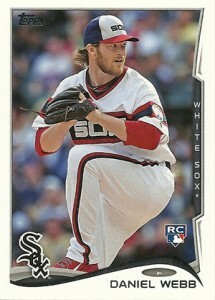 Also, #US-70 Jarrod Saltalamacchia is mismatched on the site. 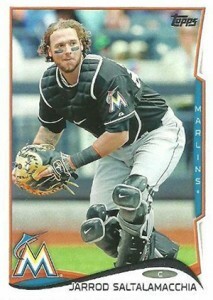 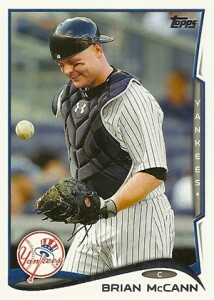 The catcher’s gear card is the base card. 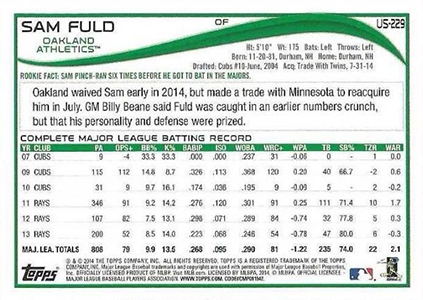 Sean Siffel � Thanks! 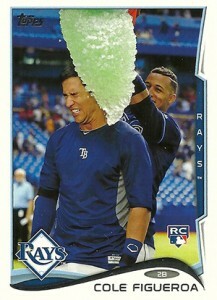 Just made the update. 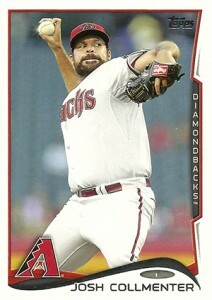 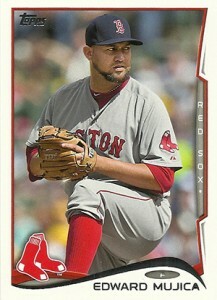 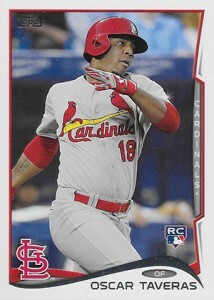 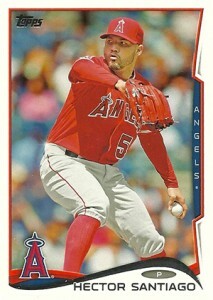 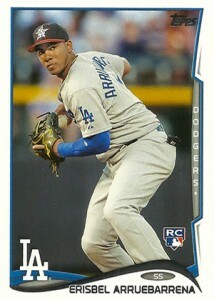 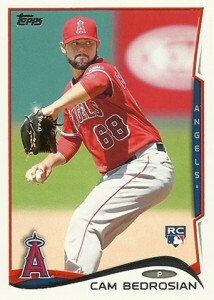 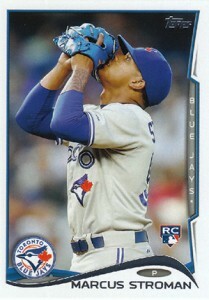 I pulled a photo variation of Erisbel Arruebarrena, card number US-196, and it is autographed and serial numbered 4/5! 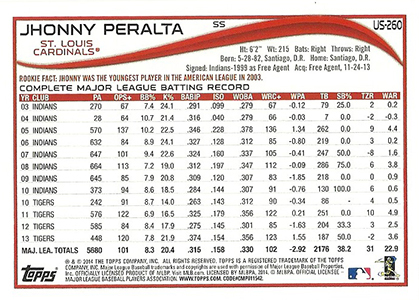 Can you provide any more information on this parallel? 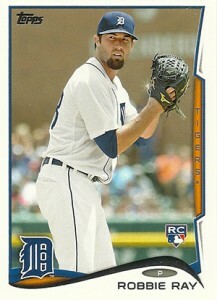 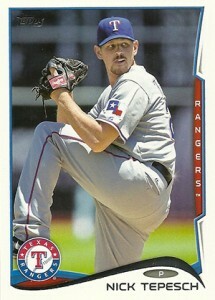 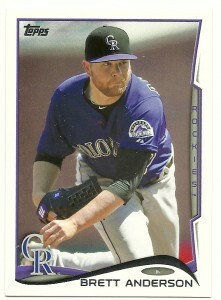 I pulled two cards #’d US-117 John Lackey and Bryan Holaday. 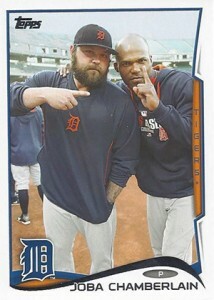 Both of them have the code on the back ending in 480…. 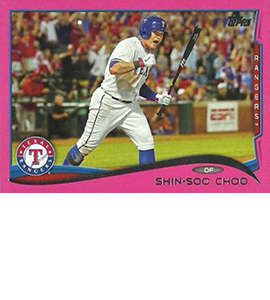 Has anyone else found these? 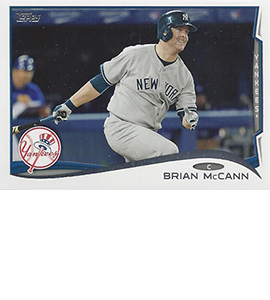 Ryan � They’re both base cards. 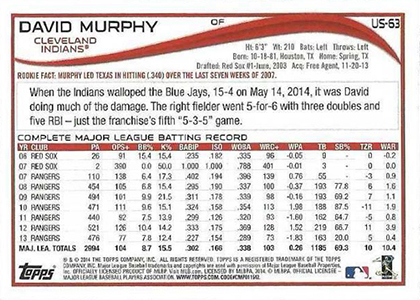 There are a couple of duplicate numbers and a couple of missing numbers. 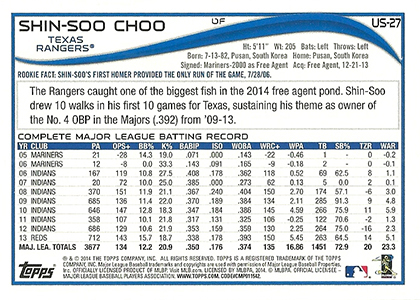 Rich S � As mentioned in the previous comment, they’re both base cards. 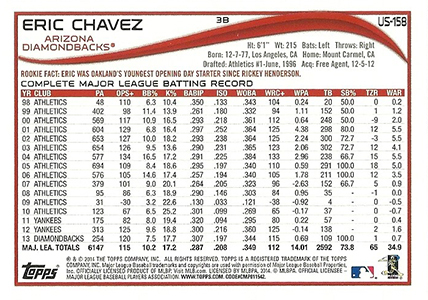 There was a mess up with a couple of the numbers. 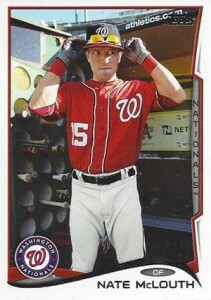 Ryan-thanks for the clarification. 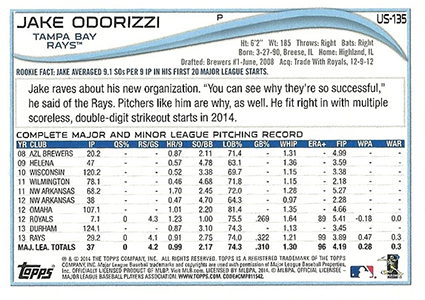 I did not see your previous information. 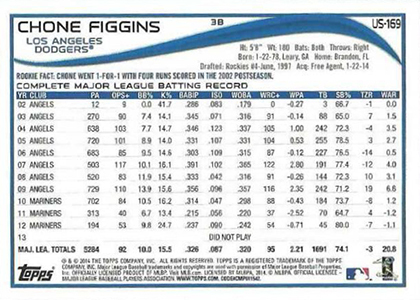 Do you have any particulars on the missing numbers? 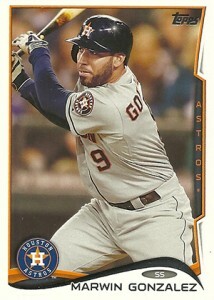 I see lots of cards on eBay that are not on your master-list. 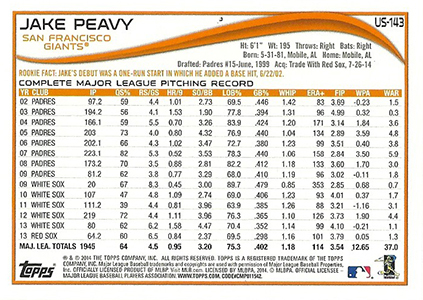 Such as #6 and #12 Can you offer any more help? 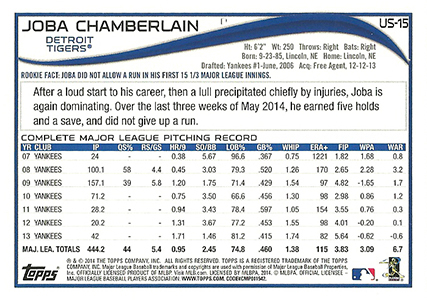 john cleveland � What are the missing variations? 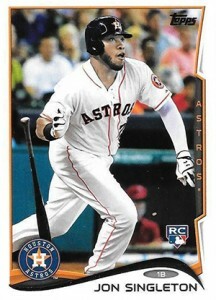 We confirmed our checklist with Topps and were told it was complete. 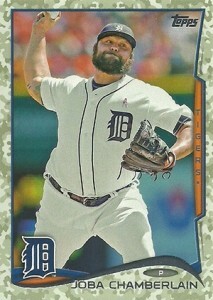 I have a camo card with the code 7287 but my other camos all end in 480? 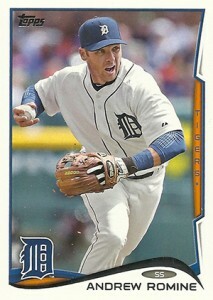 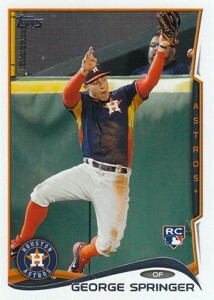 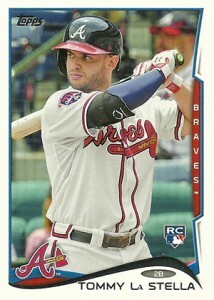 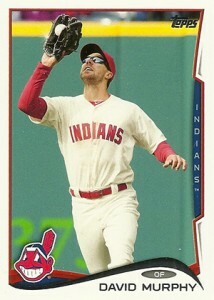 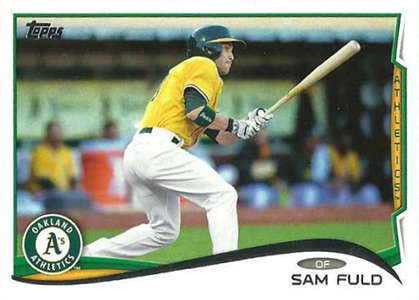 Sparkle variation for US-205, Sam Fuld, has him in an Atheletic’s uniform, and the card is horizontal. 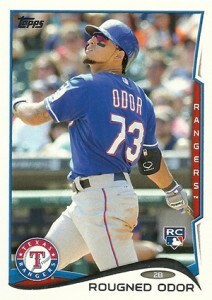 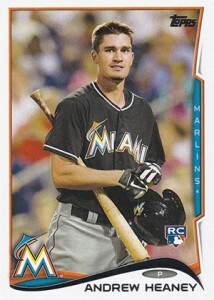 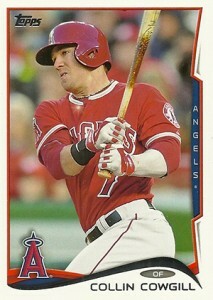 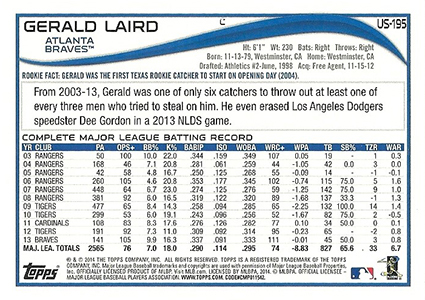 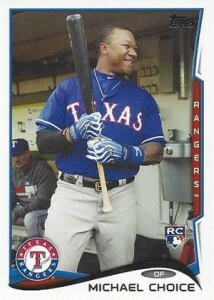 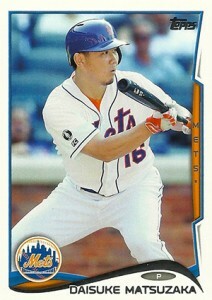 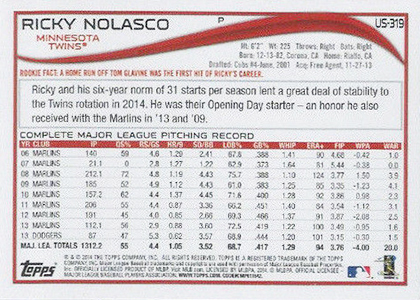 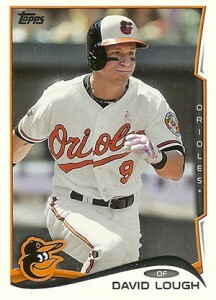 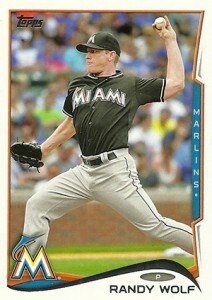 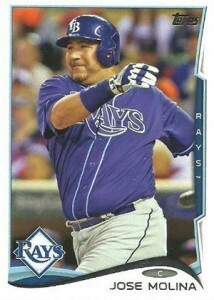 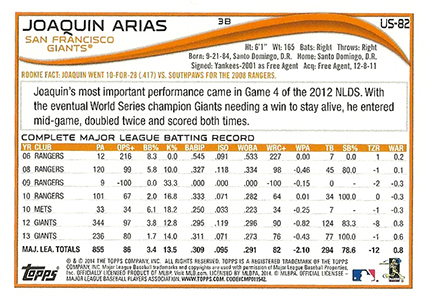 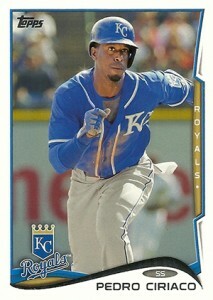 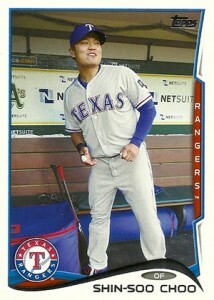 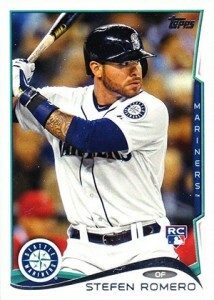 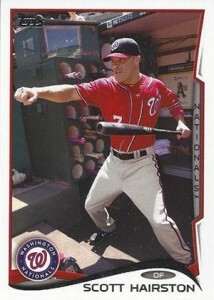 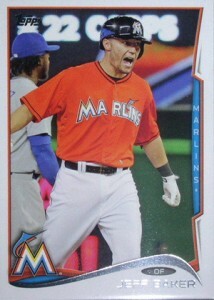 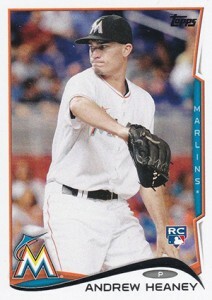 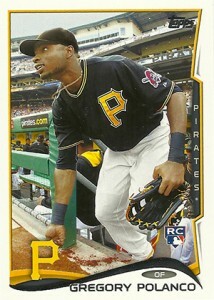 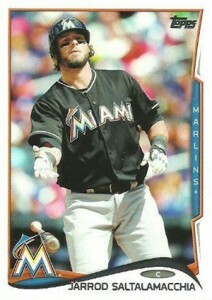 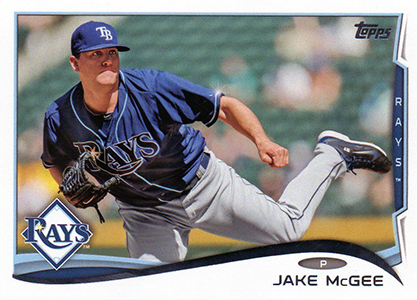 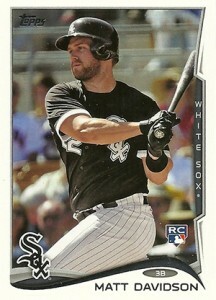 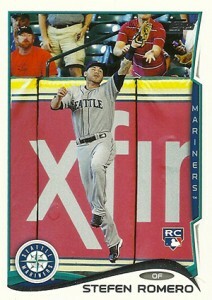 The base card appears to be vertical and he is in a Marlins uniform. 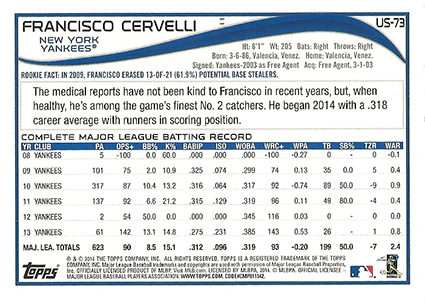 Can you check on this? 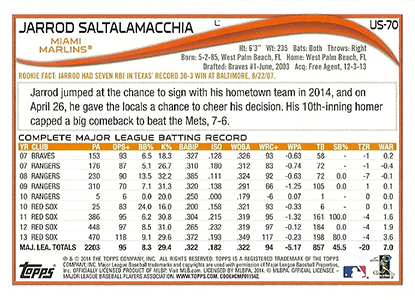 paulb � His base card has the same image. If I remember correctly, there was something funny with some of the numbers where the players didn’t match up exactly the same. 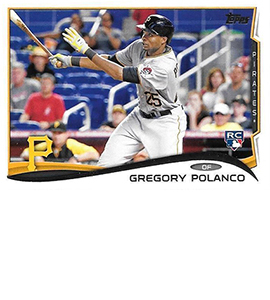 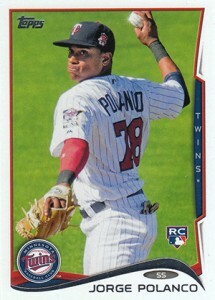 MISTAKE ON CARD NUMBER US-237 JORGE POLANCO BLUE(WALMART) CARD.ON THE BACK IT SHOWS HIS CAREER STATS LIKE 77 GAMES PLAYED ,347 HITS,166 3B,154 HR SON ON WITH A BATTING AVERAGE SHOWN AS 3.99 LIKE ERA.AN I NUTS OR IS THIS AN ERROR CARD. 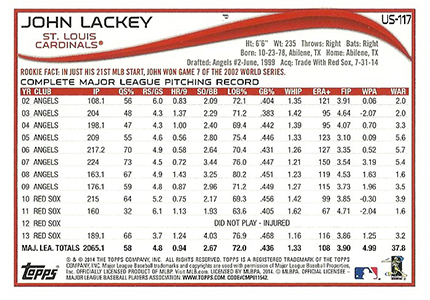 PLEASE LOOK INTO THIS AND I WOULD GREATLY APPRECIATE IT. 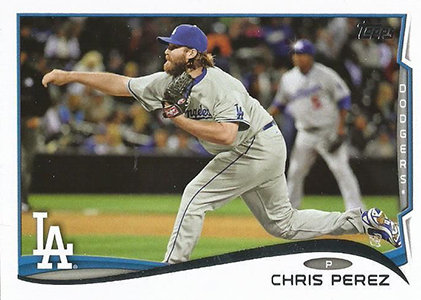 MICHAEL PEEKE � Even if it is an error, it was not corrected. 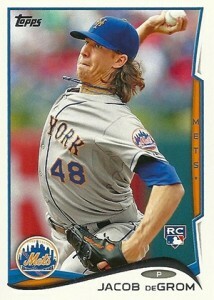 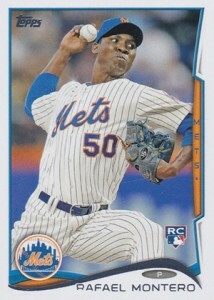 Jacob degrom has a debut card that is horizontal. 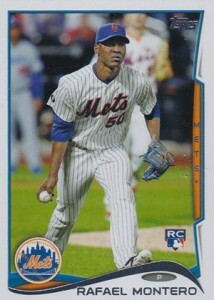 Whats the word With that variation? 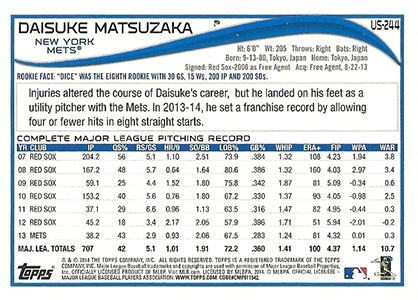 marie � Different card number. 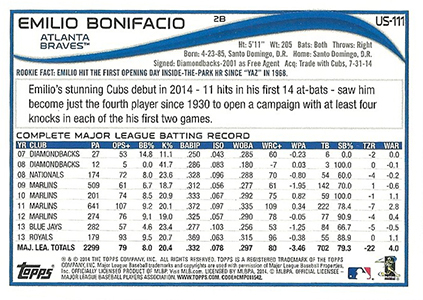 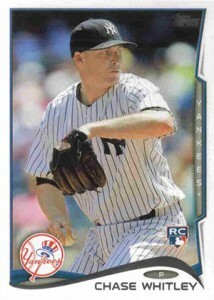 It’s considered a subset card for his first game and is totally different than his regular card.